Old map by MÜNSTER -Die erst General Tafel, die Beschreibung und den Circkel des gantzen Erdreichs und meers innhaltende. . . Title: Die erst General Tafel, die Beschreibung und den Circkel des gantzen Erdreichs und meers innhaltende. . . Size: 12.2 x 14.2 inches. Condition: Wide margins, fine and clear impression with authentic appearance. Minor toning with the typical binding pin-holes. Good overall condition. This woodcut map is printed on thicker and better quality paper than many other examples of this map where the text on the reverse often shows through. Lovely full colour example Sebastian Münster's oval map of the World, first published in 1588. It is filled with small monsters, sailing ships and fishing boats in the seas across the world. The nicely ornamented cartouches contain text in gothic German. Relief is shown pictorially. The woodcut technique with its insertion of calligraphic lettering is amazingly elegantly engraved, almost in the style of the copper engravings of Ortelius, Blaeu, or Hondius. The corners are decorated by a florid vine leaves pattern. Interesting cartographic features of the map include a huge southern continent and a Northern Passage (both Northwest and Northeast) to Asia. This charming map was published in the 1588-edition of Sebastian Münster’s Cosmographia. That edition had become necessary following the many discoveries and explorations since the 1550-edition, Münster’s Magnum Opus. All the maps were recut to bring them up to date. After 1588, this map was only re-published in the German editions of the Cosmographia of 1592, 1598, 1614, and 1628, and is thus rare. The 1588-maps are often considered the second state of the maps published in Münster’s Cosmographia of 1550. 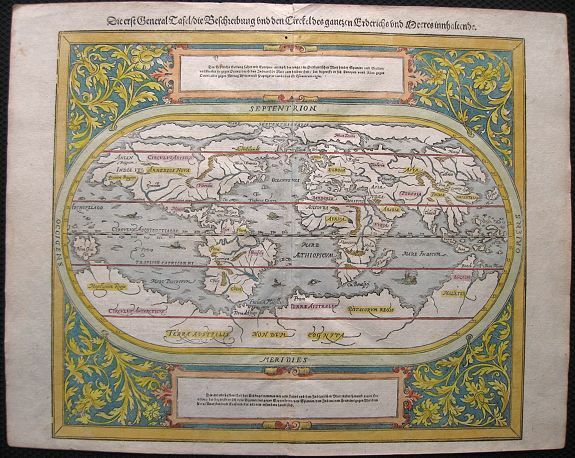 That 1550-world-map is also offered in this auction. Münster presented his world-maps with its new discoveries, juxtaposed to the Ptolemaic world maps, reflecting the older geographical knowledge.